Even if you've never made a photo book before, chances are you've heard of Shutterfly and Snapfish before. They are two well-known and well-established companies in the photo book space, not to mention in the online photo service industry in general. Snapfish a division of HP (Hewlett Packard) started its online photo service in 2004. Shutterfly has been around since 1999. Both companies have very similar product offerings including photo books, and a broad range of photo gifts such as calendars, notebooks, mugs, mouse pads, canvas prints, photo enlargements and custom holiday cards, as well as offering photo sharing and photo storage. In terms of photo books, Shutterfly and Snapfish both offer square and landscape oriented books ranging from 7 x 5 to 11 x 14 inches. Shutterfly offers a 10 x 10 size that Snapfish does not. Snapfish's standard books can go up to 150 pages while Shutterfly maxes out at 110 pages. Both companies now offer lay flat books, both with a seamless gutter (each set of pages is printed on a continuous sheet that folds in the middle). Both lay flat options offer a much thicker paper than the typical paper you'd find in standard photo books. Snapfish touts that unlike its competitors they do not put a barcode on their premium lay flat books. (Shutterfly has a barcode on their lay flat upgrades, but I'm not sure if that's the case on their premium leather books as well. I will update when I find out.) Snapfish has also added a hinged lay-flat book offering. Notably, while other companies with the hinged lay flat option (i.e. MyPublisher) charges an extra fee for it, Snapfish is throwing the hinged lay flat option in for free. Note that choosing this option will lower page maximums to 90 pages versus 150 pages, but for the bonus of getting a lay flat option for free, that makes Snapfish's prices very competitive. 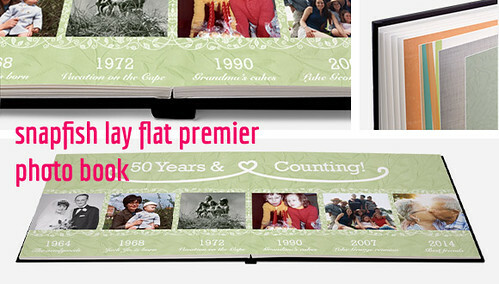 Lay flat photo books are very popular and many folks who try a lay flat book, prefer them to the ones that don't. I don't exclusively make lay flat books, but if I want them to be a little extra special, I do tend to opt for lay flat. For a detailed overview of lay flat options, check out my ultimate lay flat photo book comparison. In terms of paper options, Snapfish does not offer paper upgrades for their standard books. The paper is listed as a 100lb. archival paper in a semi-gloss finish. Shutterfly's standard paper is 65 lb. glossy paper stock (until more recently, Shutterfly used 100 lb. paper as noted on their website). The numbers may be misleading, as Shutterfly's paper doesn't seem that different now than it was before the change. For standard paper, I found Shutterfly's paper a bit thicker in feel than Snapfish's. The lay flat books from both companies feature an upgraded paper, heavier than the standard paper, with pages that don't crease. 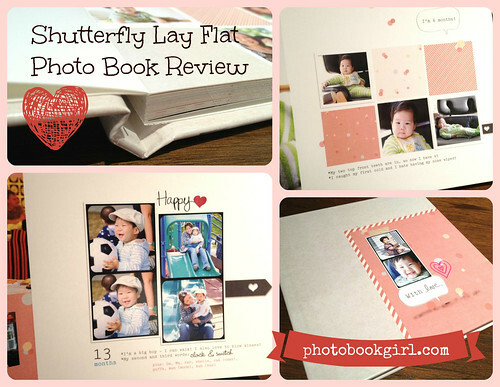 Check out my review of Shutterfly's lay flat book here. Those who are fans of digital scrapbooking may prefer Shutterfly over Snapfish as Shutterfly appears to have more themes, however Snapfish has added some more clip art recently, from well-known crafter Martha Stewart in addition to other updated embellishments. Snapfish also offers some Disney themed photo books featuring popular characters from Cars, Disney Princesses and Jake and the Never Land Pirates. Shutterfly also offers additional themes and backgrounds (some of which require an additional fee), and have a lot of attractive designer pre-made layouts to choose from. By the way if you're looking to make a Disney photo book, I've made several and have some tips to share. You won't want to miss this Disney photo book series. As for print quality, both companies have good print quality (comparing their standard books), but Shutterfly's books appear more neatly constructed and more finished overall. Snapfish doesn't have a blank cover page before the printed pages start as Shutterfly does. Additionally, Snapfish's hardcover books are stitched, which some believe make a book sturdier and thus higher quality construction-wise, but it's actually the stitching that to me detracts from the look of the book. I haven't had any issues with my books that are bound by glue, so the lack of stitching is not an important feature for me personally, but I mention it because it may be an important feature for you. Price Comparisons - Who's Cheaper? If you're looking for a deal, both companies run frequent promos. Snapfish offers more buy one get one and sometimes buy one get two books promos, so typically, if price is the top concern, Snapfish's prices are normally lower than Shutterfly's. With that said however, Shutterfly often comes out with free book promos and also has its fair share of big discounts on photo books. Shutterfly is also one of the only companies I know of that allow you to "stack" coupon codes. So, for the most part (subject to some limitations) you can keep entering as many coupon codes as is applicable to your order and the discounts can even be taken on top of sale prices. I have even been able to stack a Groupon with another Shutterfly promo which results in some pretty amazing savings. Depending on the project, I often look for the best photo book deal running at the time. You'll find numerous in-depth reviews on my site of both companies' papers and view actual books that I've made under their respective review pages. If you're trying to make a decision between Shutterfly and Snapfish, you have to decide which factor or factors are most important to you. The company you go with may be dictated by the specs of your particular project. For me personally, I print more photo books with Shutterfly, but for other custom photo gifts, I have found a lot of great deals on items such as personalized notebooks on Snapfish. I also have not tried Snapfish's lay flat books yet and it looks like something worth trying out. Snapfish's free hinged lay flat upgrade is also notable. I'll be sure to provide an update when I give it a go! This is just a general overview of the two companies and their main similarities and differences. I have written several articles with tons more detail about both companies as you'll see at the bottom of this page. You can also visit Snapfish or Shutterfly directly for more information. See my Shutterfly review. There are 25 photo books available from Shutterfly, with sizes ranging from 7x5 to 12x12. See my Snapfish review. Snapfish offers 13 photo books, ranging in size from 3x2 to 14x11.